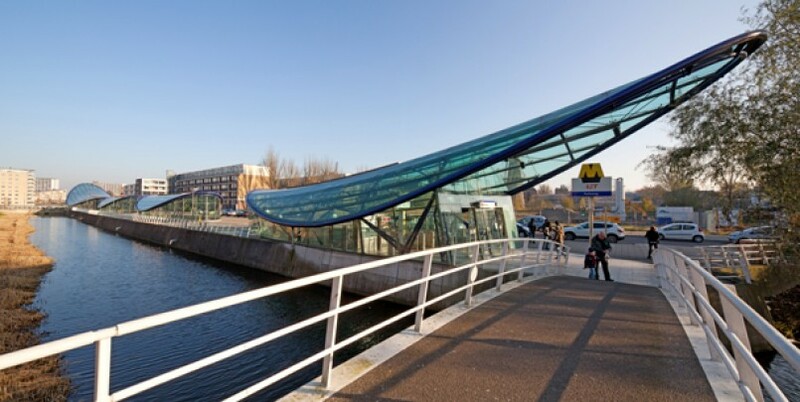 The Benelux metro line runs from Marconiplein in the city centre through the widened Benelux Tunnel to Hoogvliet. While everything between the stations has the same design and layout, each metro station is a one-off affair with its own architect and its own local characteristics letting travellers know immediately where they are. Tussenwater station is sited where the new line feeds into the existing network. A structure of self-bearing precast concrete portals placed at short intervals shapes the space round the tall stair towers and doubles as the building's skin. The spaces between the portals have a glass finish. Passenger safety is expressed by well-lit spaces with no hidden corners, their interiors tiled in red and violet.